At Bitfinex we have been putting a lot of work lately into improving our APIs, as such we would like to engage with the community of traders and developers who integrate with and use our API. Next Wednesday, April 13th, we will be having a Google Hangout to get some feedback from our users as well as share with everyone what we’ve been working on and some plans for what’s to come. We have also released a set of open source libraries in nodejs, golang, and ruby for interacting with our REST and WebSocket APIs. Our goal is to create an easy way for developers to work with the Bitfinex platform by maintaining an always up-to-date library in their preferred language. We are looking to publish more open-sourced libraries in the future, such as C# and python, as always any help is appreciated. Along the same line of thinking we are starting a section of the API documentation devoted to community projects. Many developers have spent a lot of their time on really cool projects and we think they should be recognized for that. It also benefits the entire user base as they now have access to more tools for using the API. All of the code can be submitted under any license the author wishes, but as we are a bitcoin company at heart, we strongly encourage open source development. We’re excited to see what applications are created for interacting with our APIs. While making an API easy to use is important, the API must be high-performance with minimal latency. Two weeks ago we refactored the underlaying API layer achieving a significant visible latency improvement on all private REST calls. 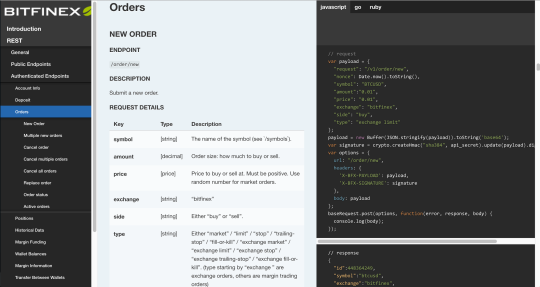 This is the first of a number of improvements we plan to make on the REST API, with development on v2.0 starting soon.